In this time of budget crisis, and with some time to reflect on the Parks Department’s design plan, it is the perfect moment to revisit the Washington Square Park redesign and rework the plan thereby maintaining elements of this dynamic, well-functioning public space as they are. I have been working with others on a petition and letter to elected officials on changes going forward at Washington Square Park. Additional feedback and any strengthening, rewording, etc. of the demands is appreciated. The petition is drafted to Mayor Michael Bloomberg, NY City Council Speaker Christine Quinn, Public Advocate Betsy Gotbaum, Council Member Alan Gerson, Parks Commissioner Adrian Benepe, and Comptroller William Thompson. Individual letters can also be sent to these elected officials by going to NYC.gov. We, the undersigned, believe that the design of Washington Square Park, before construction began in January ’08, was a well-functioning model that fit the needs of park goers and contributed to this Park’s reputation and renown as a dynamic public space in New York City. Washington Square Park’s basic maintenance and repair had been woefully neglected over the years by the New York City Parks Department. Repairing, upgrading and freshening up the park (lawn, bathrooms, pathways, fountain, etc.) — working within its existing design — would have saved the city money and pleased the majority of the Village community. The current redesign plan is an unnecessary overhaul of this space and costly (budget now at over $25 million from $16 million originally) to New York City in a time of budget crisis. We regret the loss of the sunken nature of the fountain plaza, the moving of its historical location(since 1871), and, thus far, destruction of 14 of the Park’s mature trees. Now that Phase I is almost completed, Phase II and III have elements that can most certainly be addressed. 1. 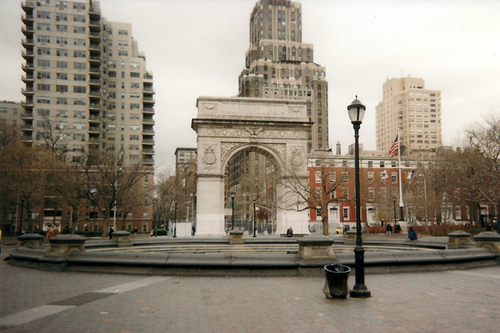 No Conservancy: We want Washington Square Park to remain a public park without corporate influence. 2. Preserve the Seating Alcoves Along the Northern, Eastern and Southeastern Edges. In the redesign plan, these areas are scheduled to be removed. People utilize and enjoy them for reading, music, studying, talking. They further contribute to the charm of the park. 3. Maintain the public space around the Fountain. Numbers vary as to whether the entire Plaza will lose up to 23% of its valuable public space. The NYC Parks Department has been less than forthcoming in confirmation of this number. 4. Save the Park’s Trees. Work all existing, mature trees into the design. They are part of our urban habitat and deserve to be treated as living entities that are an integral part of Washington Square Park. 5. Change the Planned Fencing. The height of the fence at 3 feet has been a core design element of the park and is welcoming and desired. The fence being installed is 4 feet (which makes quite a bit of difference) and contains decorative spears on top in direct violation of the Parks Department “agreement” with Council Member Alan Gerson and Speaker Christine Quinn. 6. Save the “Teen Plaza” and maintain height of the stage. This stage has worked well for many years for the Washington Square Music Festival and other events. The current height is 36″. The proposed height of the stage at 22″ is much too low for classical music performances and other usage (protests, other performances, etc.). I just wonder…will they reopen the “new” western side of the park, then close and work on the eastern part? or just close the whole thing until it’s entirely “new”? It’s my understanding that they will open the “new” (as you say) side of the park (sometime in the near future) and then in the spring close the rest for that part of the redesign. It’s going to be somewhat strange to say the least – a bit schizophrenic when half is done and half is not – but it’ll be nice to have the entire park open!